Not to be confused with Yellow Shell. A Gold Shell is a rare type of Koopa shell. It first appears in Super Mario Galaxy, where it is the objective of some missions. In later games, it can give Coins. In Super Mario Galaxy, the Gold Shell only appears in two missions: "Passing the Swim Test" and "Bigmouth's Gold Bait." When the player arrives at the Beach Bowl Galaxy, they learn that the penguins' Coach gave his students a "swimming test" where the students have to find shells. He states that the penguin that finds a Gold Shell instantly gets an A. When the player dives underwater after speaking with Coach, they will see that a penguin has already found the sole Gold Shell. The player must swim up to the penguin, who, refuses to give up the shell. However, the player can take the Gold Shell from him by spinning, allowing them to take it back to Coach, who is so impressed that he gives Mario a "gold medal" (which is actually a Power Star), only to realize Mario is not one of his students. After Mario gets the Power Star, he will have to leave the Gold Shell behind. In the Bigmouth Galaxy, the player finds a golden Treasure Chest that will only open if they bring back a Gold Shell. After swimming through a dangerous cavern in the darkness, the player must find the Gold Shell to bring back up, where it opens the chest, freeing the Captain of the Toad Brigade, who was trapped in the chest. He gives Mario a Power Star as a thanks for freeing him. Gold Shells return in the Nintendo 3DS game New Super Mario Bros. 2, where they are now the golden versions of the average Koopa shells. They are much more common here, as Gold Shells appear when Mario passes a Gold Ring. When a Gold Koopa is stomped, they retreat into their golden shell, and if kicked it produces a trail of coins behind it. Gold Shells also appear in Super Mario 3D World; once again, they are rare. They only appear in Koopa Troopa Cave, Sunshine Seaside, and Coin Express. They function similar to the ? Box and Gold Shells in New Super Mario Bros 2: the player gains coins for Shell Dashing with these shells. There is also no character color code for the shells. In Super Mario Odyssey, a Gold Shell is worn by one of the Roving Racers who only appears in the Master Cups. In Mario Kart Arcade GP DX, Gold Shells act just like Black Shells, but instead of being thrown normally like a Green Shell, they home in on the driver in front of the player, like a Red Shell, exploding upon impact. 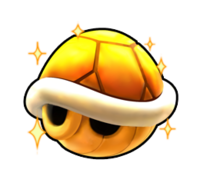 Triple Gold Shells can be unlocked and used as an item as well. This page was last edited on March 2, 2019, at 20:18.